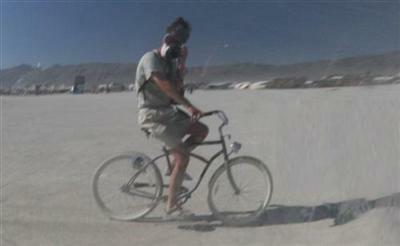 If you go to Burning Man, it's imperative that you have a bicycle. The playa at Black Rock City is miles across, and your experience is necessarily reduced if you're not able to cover the flat expanse of dried baked lakebed silt at a good clip. What you need is an inexpensive bike with a headlight, large off-road bouncy tires, and a soft seat. After searching for used bikes for sale and finding only bikes that needed "a little work", we stumbled onto this website for Black Rock Bicycles. Randy, the owner, is as cool as the other side of the pillow. He rents the bike for the duration of the event for $50. But the kicker is this...if the bike is stolen, or if you decide you want to keep it, you only owe another $50. This is a big deal because, my bike was stolen this year. Some rotten criminal swiped it from that gnarled pile of bikes stacked ruthlessly in the desert at 2:00 and Esplanade. You know the one I'm talking about...right outside of Opulent Temple. In any event, I was relieved to learn I only owed him $50. I was afraid it would be more like $500. Go to Randy's Black Rock Bicycles web site and you'll be sure to have a good burn.